Big Jolt has been over for almost 2 weeks now, and were just getting around to assembling all the material. The event was a BIG Success dispite the 108 degree heat. 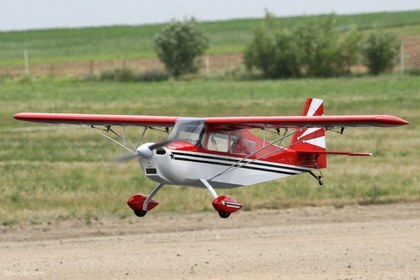 We had almost 70 Registered pilots, this year, with many coming from as far away as Arizona. This year we added a night flying competition, which we had many competitors, as well as spectators turn out for the dazzling night time flying light show. We also had the speed run, though this year was not as fast as last year due to the heat and wind, but it was sill very fast , with top speeds approaching 190Mph. Check out the Speed Trials Result Document Here. The PVMAC would like to give a BIG THANK YOU! to all of the 2011 Big Jolt Sponsors, who helped make this event such a great success. Like everyone else, these businesses are also having more difficult times these days, but they stepped up to the plate to make some significant donations to make our event a success. Be sure to show your appriciation by purchasing their products, which will allow them to stay in business during these difficult times. 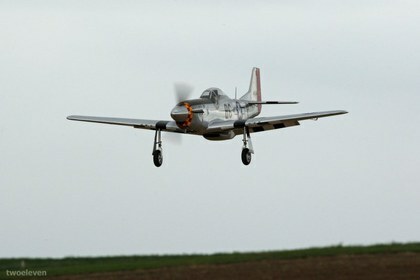 Dr. Ken Wagner is a PVMAC Member, and an avid RC pilot and modeler, and has the unique distinction of being proud owner of Lady Alice, a real P-51 Mustang. Dr. Wagner has been very generous to the PVMAC, often donating ride alongs for raffle or auction, which benefit our club tremendously. And if you have ever been to any of our hanger dinners held during our events, you've probably had a chance to sit in the cockpit of this immaculate piece of history. And seeing this museum piece up close, you can't help but feel your in the presence of a true thoroughbred, whose caretaker has treated her as such, with passion, love and devotion. 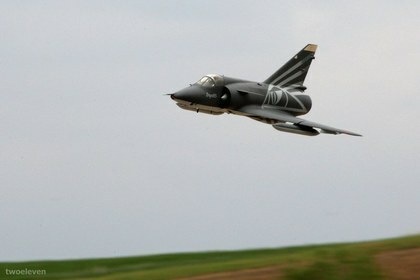 Every aspect of the plane is impeccable, and no details were spared. It reminds me of a glossy concept show car on the podium at the L.A. auto show, except it flies, and Dr. Wagner is at the controls almost every weekend. Scott Plummer of PlaneVideoArt Productions has produced and narrated a fantastic video featuring Dr. Wagner and his P-51, Lady Alice. 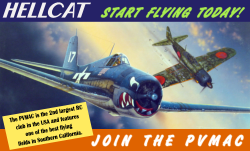 If your interested in the history of this P-51, or how Dr. Wagner came to be the proud owner, or what it's like to pilot this stallion, or what its like to ride along, I encourage you to watch this high quality documentary produced for Warbirds on the Net. 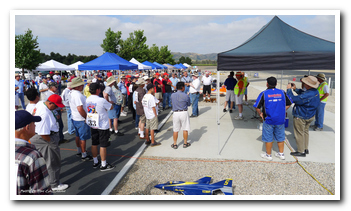 There is a nice write up of this years IMAC event that just passed on the Model Airplane News website. The write up gives a complete list of all the classes and who the winners were. The article was written by West Coast Senior Editor John Reid and the great photos were provided by Sam wright and Phil Goodwine. Check in out here! PVMAC member Allan Hess has informed me of some sad news this evening. Allan Writes; "It was brought to my attention today that Jerry Boggs, longtime PVMAC & MARKS club member passed away June 11 of natural causes. 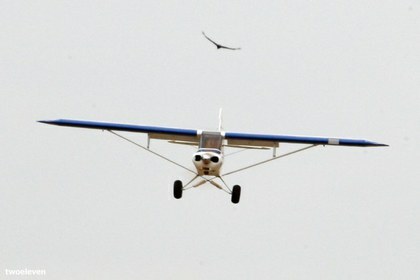 Jerry cut back his flying as of late, but used to be part of the Mon/Wed/Fri group at Norton. We are told that Funeral is at Mt. View cemetery in San Bernardino, 10am, Tues June 21. " Here is the Obituarity printed in the San Bernardino Sun on June 19. JERRY ALLEN BOGGS Age 72, a resident of San Bernardino for 37 years, passed away on June 11, 2011. He was born in San Bernardino. He was a Journeyman for 50 years with the Edison Company until 1994. He was active in the Pomona Valley R.C. Club and Marks R.C. Club. Also a member of the N.R.A. Jerry is survived by his mother, Barbara Myrle Boggs; sons, Jeff and David Boggs; Grandchildren, Stevi and Sam. Visitation: Tuesday, June 21, 2011, 9-10 A.M. with Funeral Service at 10:00 A.M. at Mt. View Mortuary . Please visit: www.mtviewsanbernardino.com to offer condolences. 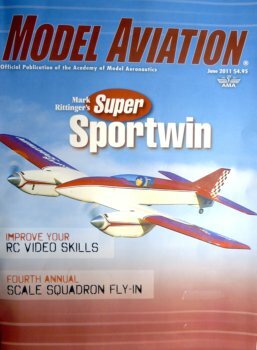 You'll definately want to pay particular attention to the June issue of Model Aviation Magazine, which should have already arrived in your mailbox, and is probably sitting there waiting to be read, as mine was. 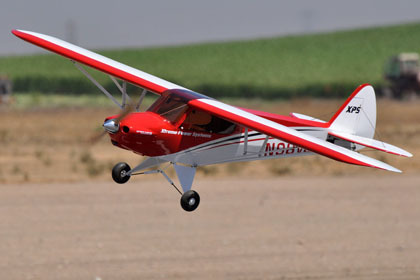 To my surprise, this issue features an article about the 2010 Scale Squadron Fly-in, which happens to be hosted by your PVMAC Club at Prado airfield. Thanks to Randy Wilbur, event organizer and PVMAC Member for writing and submitting this timely article. It has some fantastic photos, and is a great write-up of the event. This article should give a huge boost to the 2011 event as this is incredible advertisement. 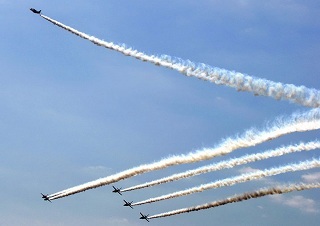 The 2011 event will be held on June 4-5, and promises to be bigger and better than last years. Be Sure to check out the event page for more information on the 2011 event. 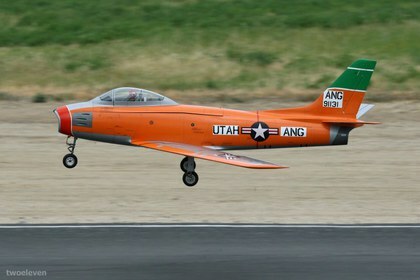 This week we are featuring expert scale modeler and PCMAC club member, Richard Pandis. 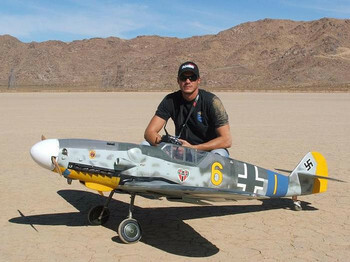 It's always easy to find Richard at the flight line as he always looks to be surrounded by has own mini German Luftwaffe. 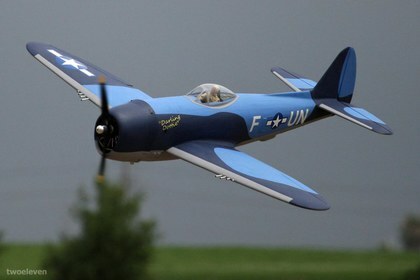 His planes are finely detailed, and he is always willing to share his knowledge on his planes, and the history behind them. Richard is also a frequent participant at most of the warbird airshows the PVMAC puts on, and his airplanes are always a crowd pleaser. Also, Be sure to check out the High Quality YouTube Video below Featuring his ME-2621A Project, produced by PlaneVideoArt Productions. I am a Federal Agent and currently mobilized with NCIS at GTMO working on the detainee issue. 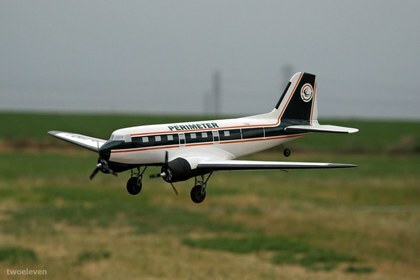 I started flying in 1984 with my neighbor Jeff Fassbinder. Kit built Eagle and Jr. Tiger. Jeff helped me build them back then. We were in 8th grade. ARF's really didnt exist yet. Im a big History buff. Prefer Luftwaffe subjects. 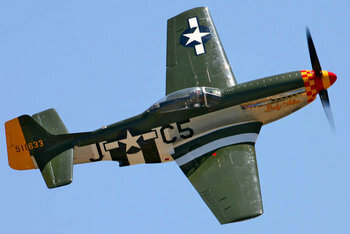 I spend more time researching the aircraft and pilot than anything. I enjoy the history almost as much as the flying. My rule is, no hanger queens...If I build it...I fly it. Right now my favorite is my BVM Electra. Really nothing like EDF power and BVM has it all dialed in. The friends I have made in the hobby. Not speaking up when I see a new guy doing something dangerous. Made it a rule to help as many less experienced modelers with basic safety when I can. Seen a few fingers lossed at the field and want to avoid that again. 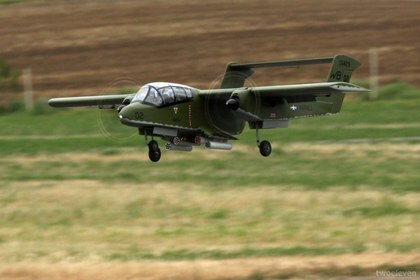 I have a 144" wingspan TA-152 H-1 Focke Wulf coming out soon. This was the Luftwaffes last fighter of the war. Only about 8 saw combat around Berlin in May 1945. David Pearson is helping on this project. 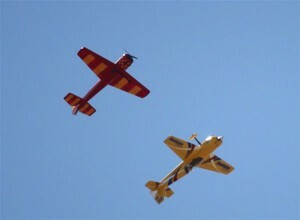 Final aircraft will be "grun 4" flown by Walter Loos. Will be a show stopper when finished. 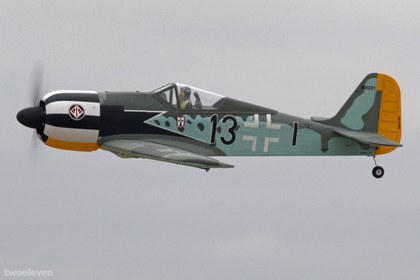 ME-262. 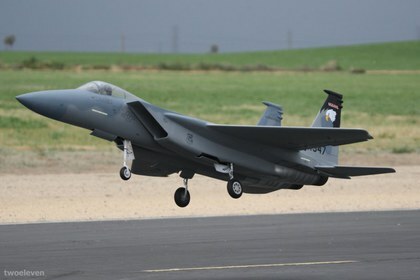 My all time favorite jet. Building one and flying it makes me appreciate it all the more.